War and revolution have focused the world's attention on the Middle East. Despite the headlines, the editors of this book state, "the economic, political, and cultural aspects of urban life in the Muslim world are hardly known to us." 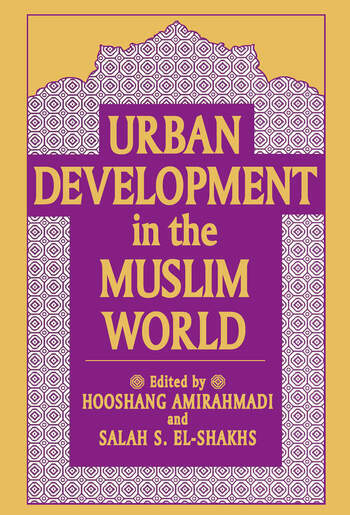 Contributors to this volume explore urban problems, urban development, and the practice of urban planning in the Muslim world.In both comprehensive analyses and detailed case studies, the contributors address the basic dilemma of development planning: how to integrate the force of tradition with the demands of modernity. Specifically, some of the topics covered include the examination of the idea of a uniquely "Islamic" city; the influence of Islam on the medinas of Tunisia and Morocco and on the development of Mecca and Delhi; and reconciling tradition and modernism in Tehran.Also covered are the comparative development of Sana'a and Cairo; the influence of oil on urbanization in the Persian Gulf; urban growth in Syria; and an overview of urban planning in the Arab world. This compendium is essential for specialists and students of the region, for international planning and development practitioners, and for those seeking insight into the complexities of this important but arguably least understood region of the world.